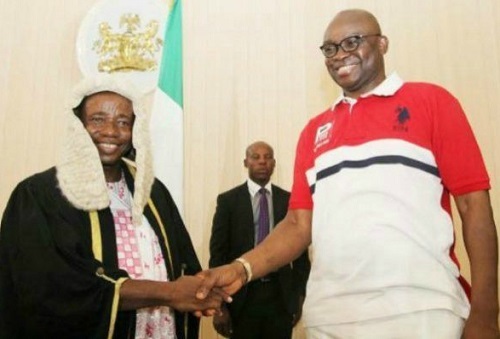 The embattled Speaker of Ekiti State House of Assembly, Right Honourable Kola Oluwawole, has described his purported impeachment yesterday as illegal, null and void, stating that he remained the Speaker of the House of Assembly. He said "what was done by some members of the House aided by armed security men is a r*pe on democracy and a descent to lowest level of lawlessness and illegality." "This is bizarre! In a democracy? This is the height of illegality and it can never stand. "As the Speaker of the House, I presided over the last adjournment of the House, which was carried out according to laws and laid down rules. "I retain the power to reconvene the House and I have not done that yet. How then can some people say the House sat? This is totally illegal. The role of the police in this siege is clear. "As I speak, I have not reconvened the State House of Assembly after it adjourned," he said. He called on well meaning Nigerians and relevant institutions to condemn the act he described as another desecration of the Legislative arm of government."